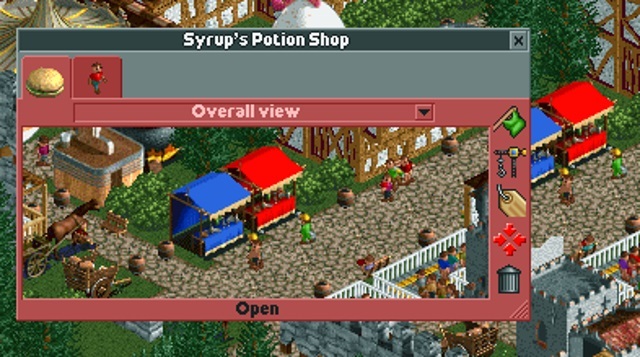 Basically, whilst building the first rollercoaster, the Double Deck Carousel broke down, but in one of the more rarer ways carousels break down in RCT2. It started to speed up and shake violently!! And, if it's not fixed in time, it explodes!!! We need to find a name for this courageous mechanic who defeated the evil of malfunctioning mechanical horses! Another update coming at ya thick and fast! 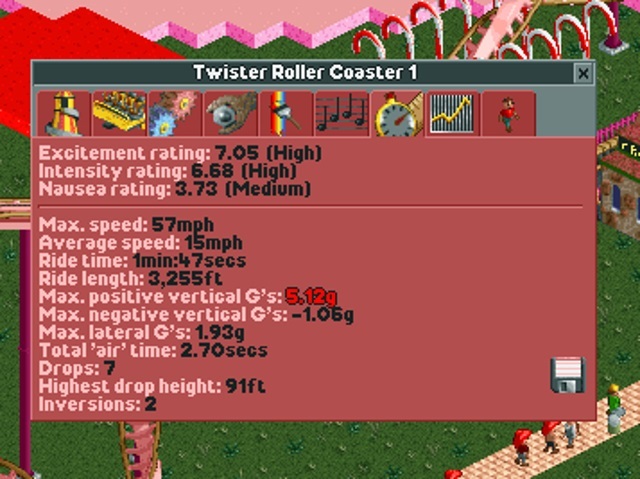 Just as with last update, the first rides were built, this time the first rollercoaster has been built, albeit not the greatest. 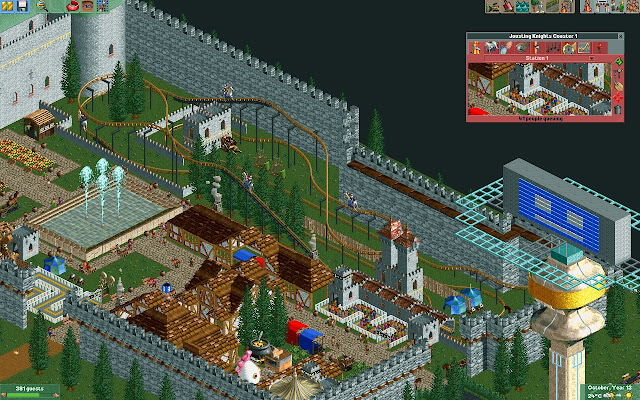 I present to you: The Jousting Knights roller coaster. 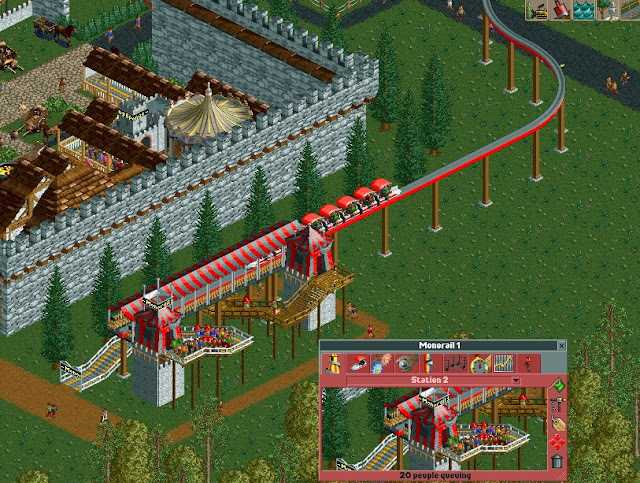 Although, the coaster cars don't quite pass each other at a point where they do joust ("The Not-Quite-Jousting Knights" might be a fitting name...). I had to shift about some of the perimeter castle walls, so the overall area isn't as symmetrical anymore, but this was an ideal small coaster to fit in the gap on the other side of Castle Town. 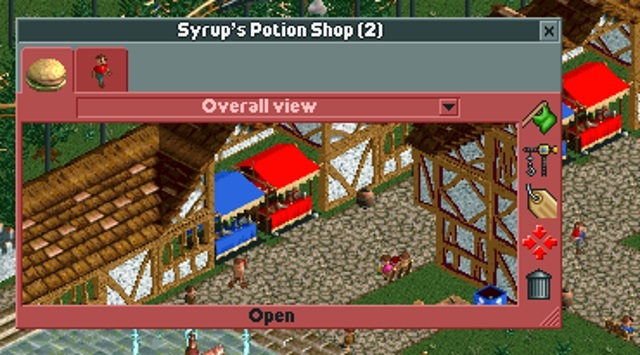 As always, this needs a name, bearing in mind that there is another horse themed coaster called a "Steeple Chase" which I plan on being the "Link-riding-Epona-adventure" sort of deal somewhere else in the Hyrule area of the park. 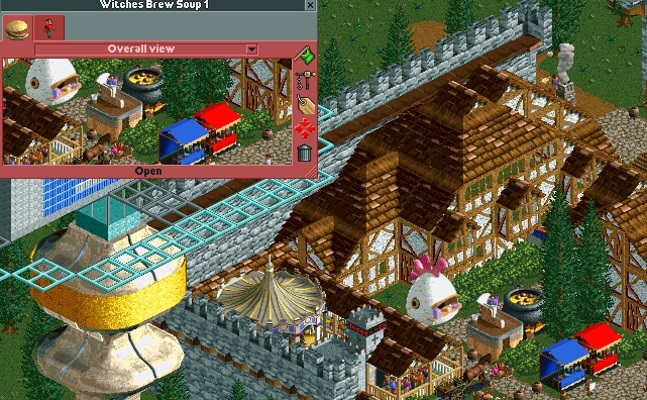 A new shop has appeared in the market area: Witches Brew Soup. A suitably fitting food stuff to fit in with the LoZ theme, which also needs a name. 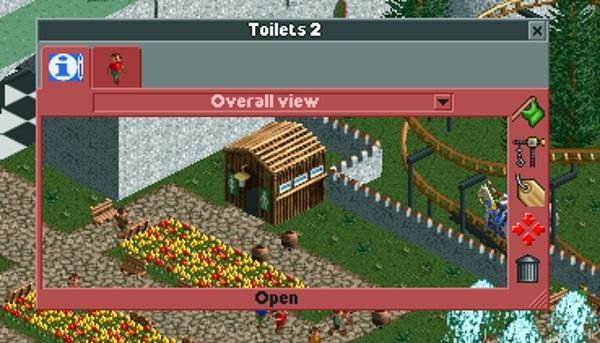 And to finish off the new constructions of this update, a couple of Log cabin-esque toilets. Zelda themed (or medieval themed) names for these too please. 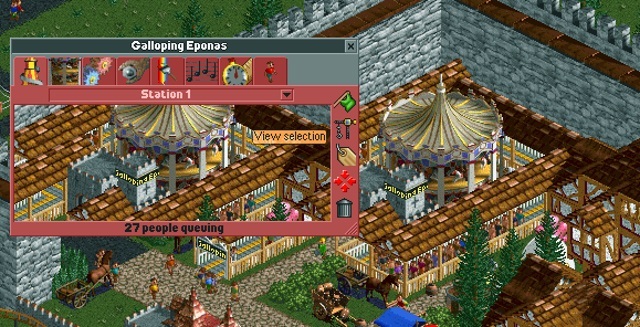 The Double Deck Carousel (after the rather terrifying event that occurred earlier) has now been dubbed "Galloping Eponas", submitted by DarkRula. The park goers thank thee, good Sir! 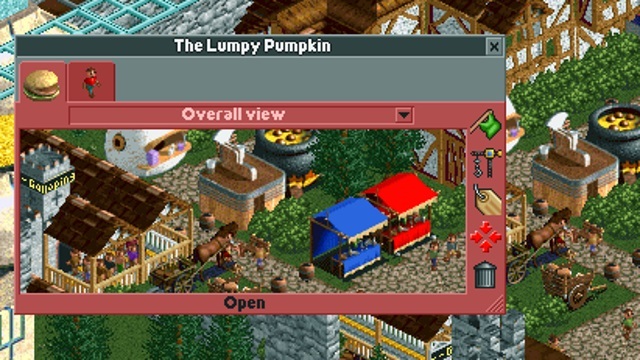 ... And the Coffee shop is now "The Lumpy Pumpkin". 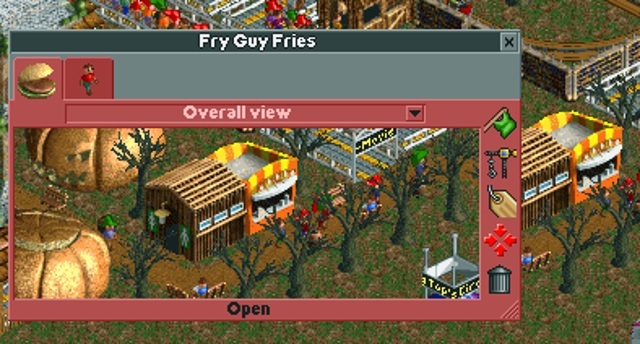 Although, if Pumpkin Coffee is being served there, I'm sure the park will receive the "Worst Food" award (which is indeed an award in the game!) Thank you for the names, OR! 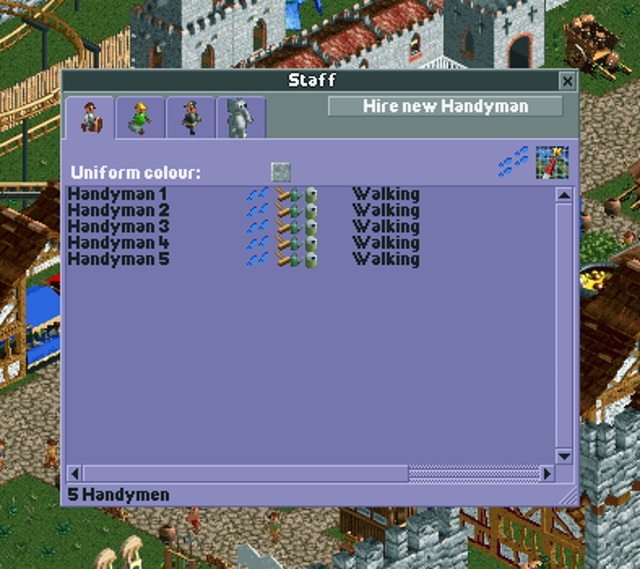 Some park staff has now been added. Several Handymen and Mechanics, who can also be named various LoZ characters, or even SONMers if you like! Looking lovely so far. 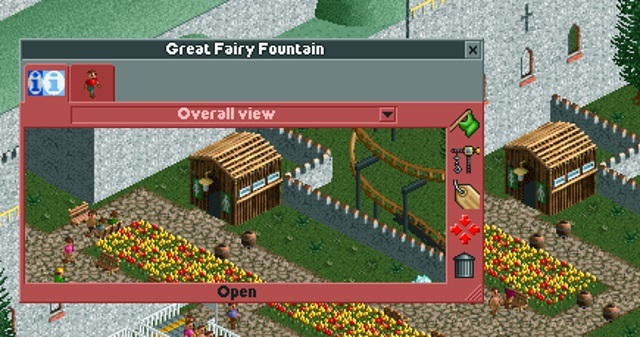 Side note the toilets should be called Great Fairy Fountains. 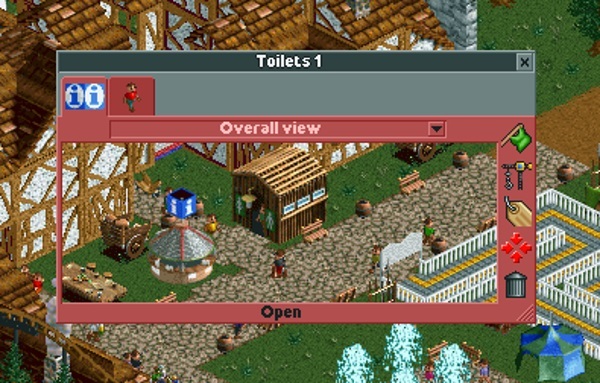 Casplen's suggestion of naming a toilet "Great Fairy Fountain" has also been entered. 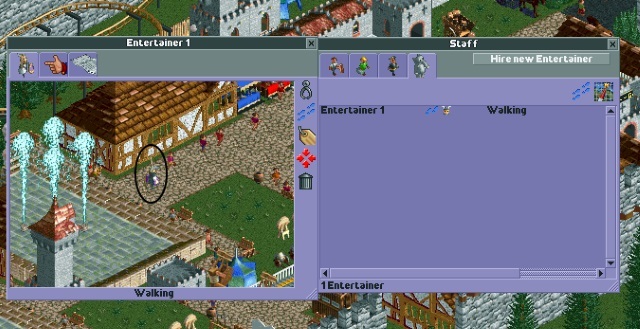 Remember the mechanic who saved the soon-to-be- exploded "Galloping Eponas" carousel? 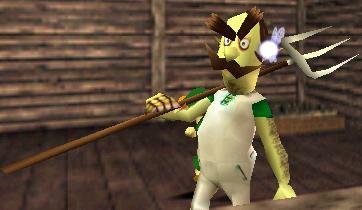 I have taken it upon myself to name him Barnes, after the bomb shop owner in Twilight Princess. 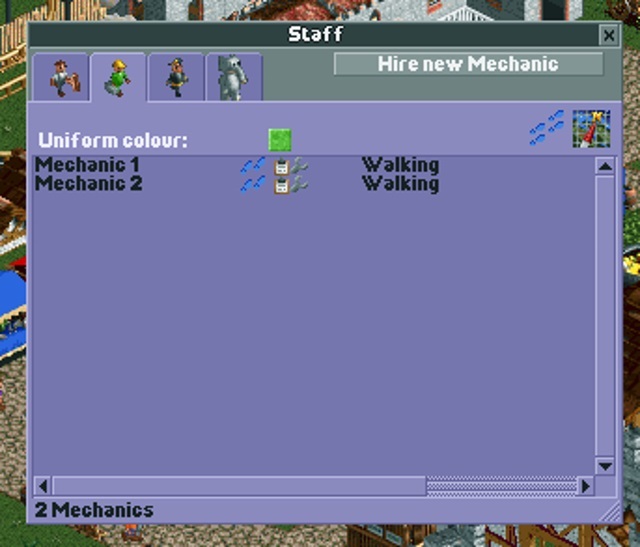 The second mechanic is now named Alfonzo, the engineer from Spirit Tracks. Loving Groose and the pirate entertainers. The Mushroom Kingdom stars are great too, will stuff be built around them? 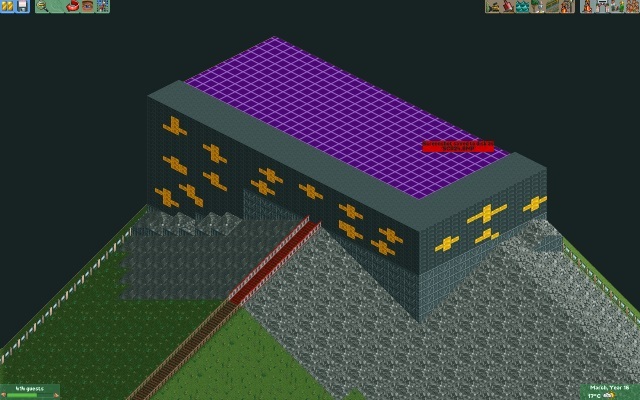 Didn't realise you could do full pixel art like that! Come on guys, I this thread can't have lost interest already! 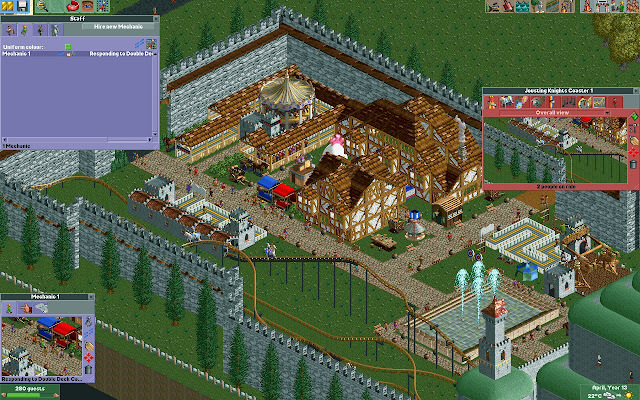 Anyways, the Mushroom Kingdom park area is coming along nicely now. Really enjoying trying to figure out the best way to make things look. 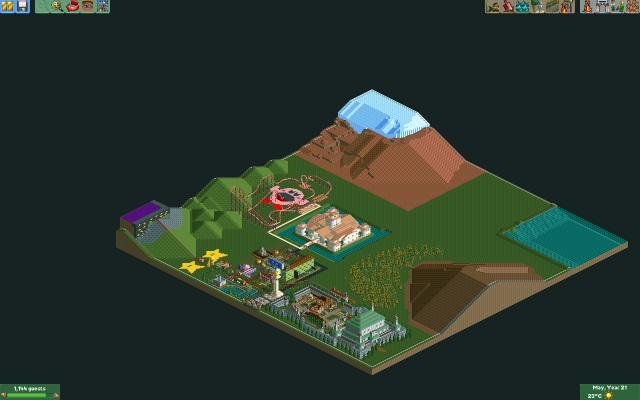 And the one ride everybody wants to see has been built. 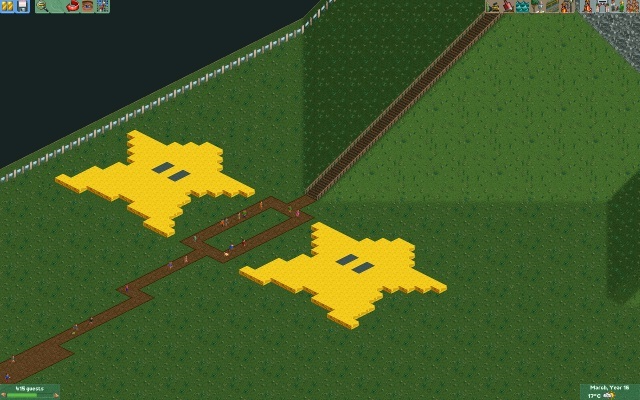 A simple Mario Kart track called "Donut Plains" (based on Donut Plains 3). 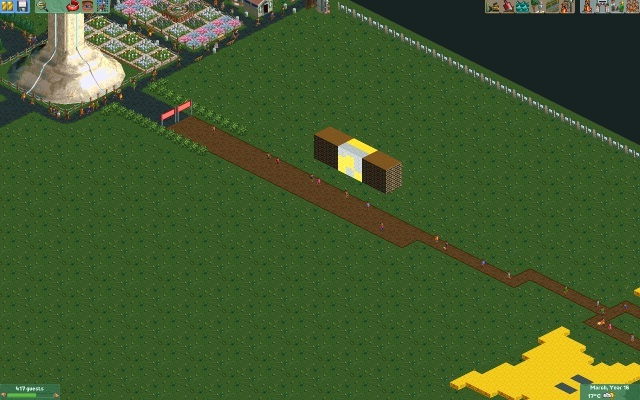 Now I know a lot of you wanted to see a Rainbow Road kart track, but as I've explained before, I think a Rainbow Ride rollercoaster would be fitting, considering the many more building options you can get when building rollercoasters. Another angle of the track. 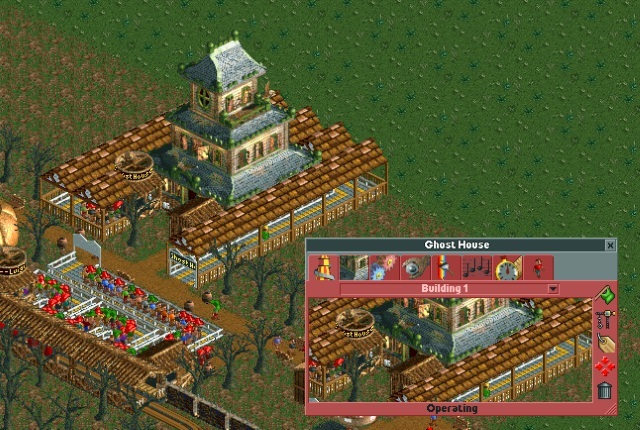 As for smaller rides that can be built here, I thought a circus would be quite fitting. 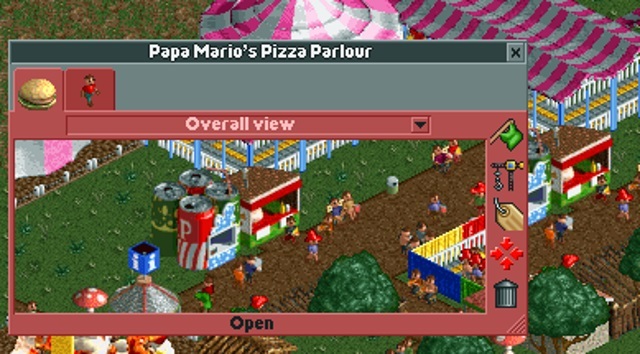 Especially when it's based on the circus from Mario Party 8, which is why it is called "BallyHoo and Big Top's Circus"
Now, this ride is a bit of a stretch, as it doesn't look like what it is meant to look like. 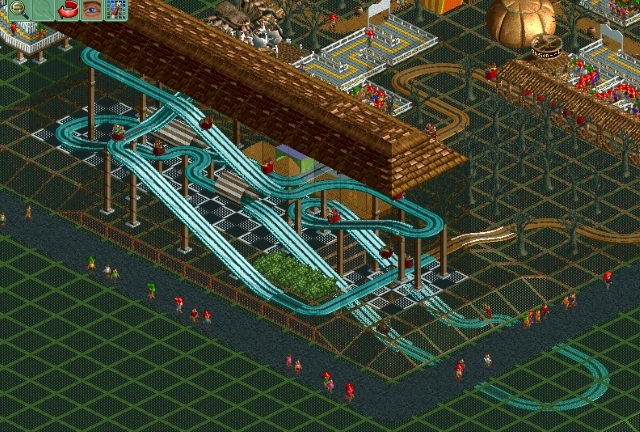 This ride (in game) is called a "Dinosaur Egg ride", so I immediately knew it would fit if I linked it with Yoshi, hence why it's called "Broken Yoshi Eggs". It's not the greatest Nintendo representation, but I think the adjacent "Stuffed Yoshis" toy stall fares better! 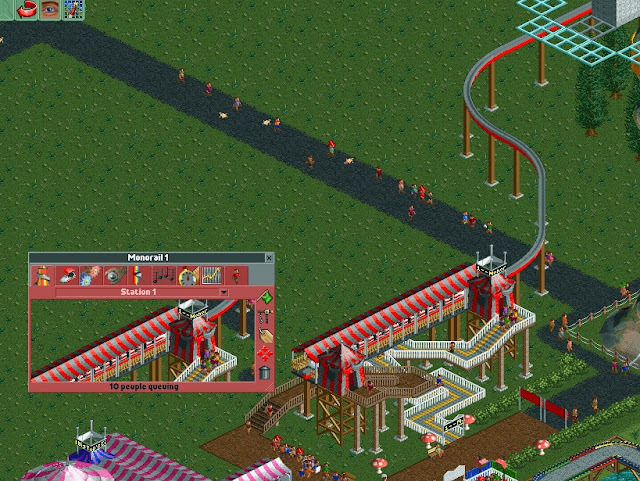 However, the hat stalls have a much more simpler idea and name behind them: Red "M Hats" and Green "L Hats"! I post, and then suddenly update (and a big one too). Love Donut Plains especially, and the monorail looks very cool. 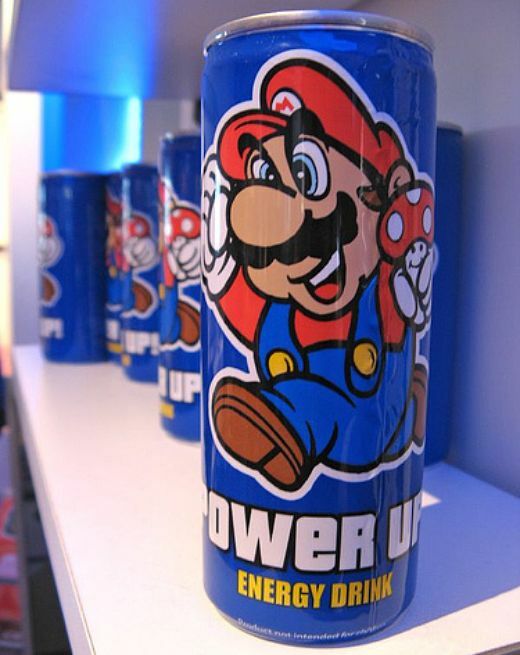 For the drinks store, Power Up drinks maybe? Yes, I like it, good name. 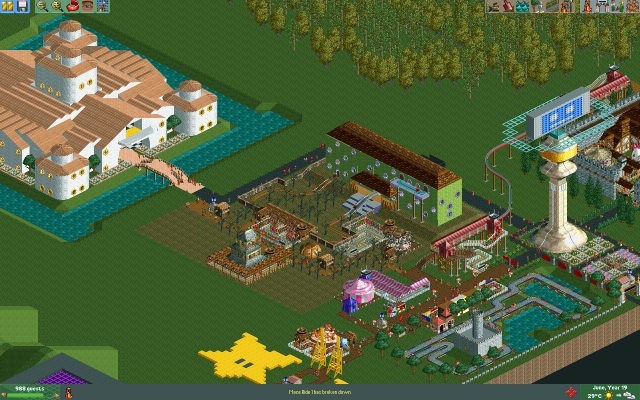 Park's coming along nicely. Looks like it's popular too. Or you could go for the less obscure rout and call it "Mario and Luigi's Pizza"
There needs to be a Kakariko Fried Cucco somewhere too. 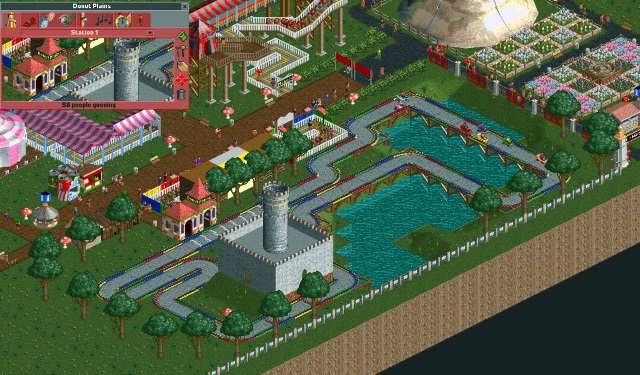 A very different, yet completely linked, area has been constructed in the Mushroom Kingdom! 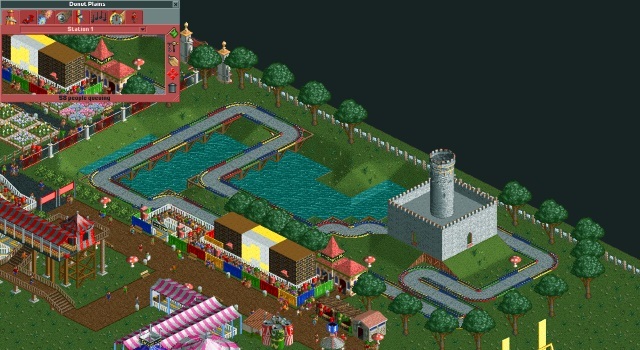 However, a highly asked for ride to appear in a real Nintendo Theme Park is located here: a Luigi's Mansion ride! Took some time to get the scenery right, and I'm still not sure I like the look of it myself, but it has turned out alright. Although, it did crash at least 3 times during testing! A view of it from the back. The little doors actually open when a car goes through them. And an underground view, made to emulate a basement sort-of-thing. 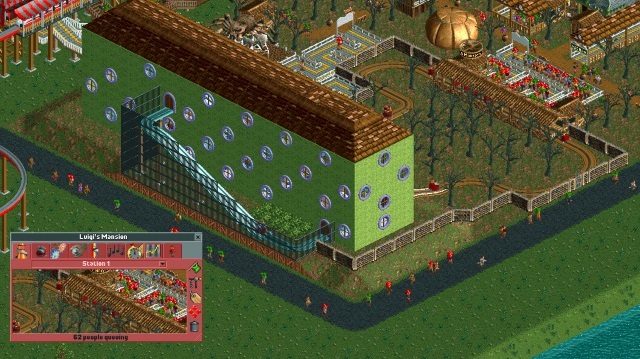 The creepy scary theme is continued with this giant spider ride. Not sure what to call it though, so suggestions please. A simple haunted house guests walk through, so naturally I called it "Ghost House", as seen in Super Mario World and subsequent Mario games. 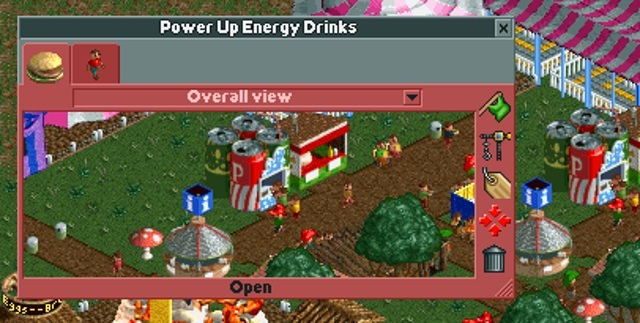 And thanks to OR for the Soft drinks stall name: "Power Up Energy Drinks", giving guests more energy to stay in the park FOREVER!! That does it for this update. 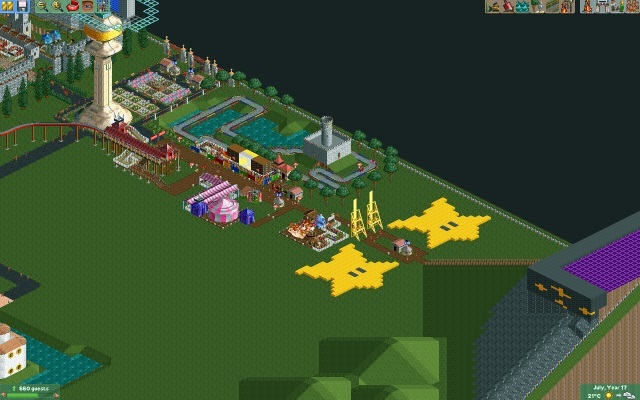 I'm starting to realise how compact I make my parks, something I need to work on so we can fill up more of Nintendo Land at a greater rate! Looking good so far! Loving Hyrule, especially. Needs more Kirby, though. 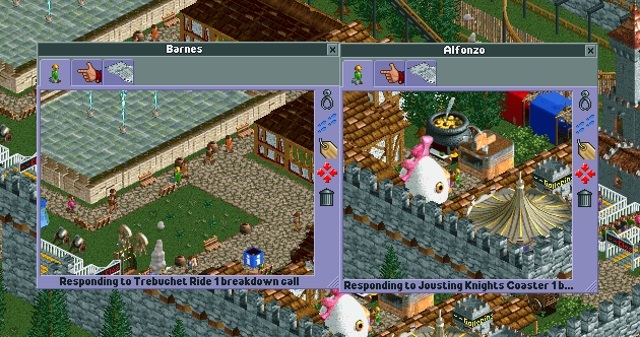 Next update, perhaps? 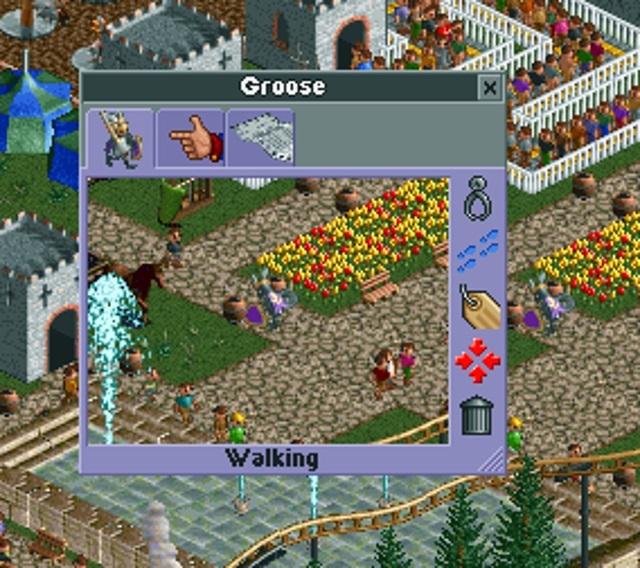 You could name the spider ride after Gohma. A little mini update for you guys, mainly in response to Troggy, who wanted to see something Kirby related. ...the coaster train gets swallowed by Kirby! 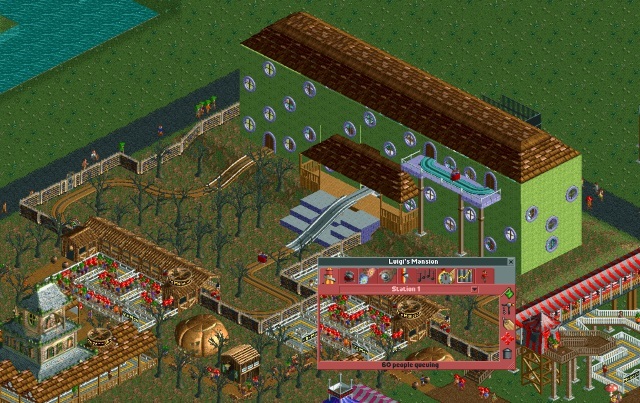 That was the big idea behind the ride constuction, which has turned out perfectly. That Kirby ride is awesome, and also gigantic compared to the other rides we have seen so far! 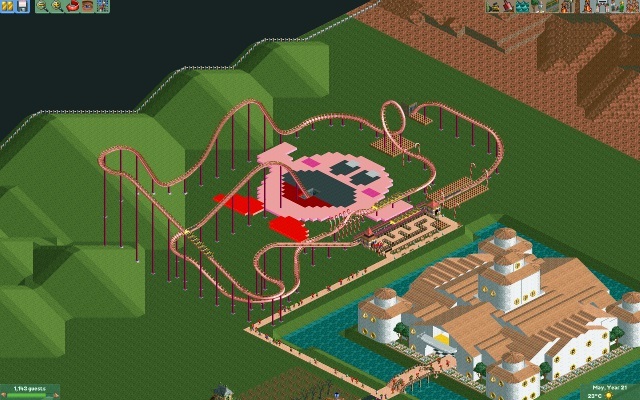 Love the pixel art kirby/getting swallowed idea, and I think it might look best from the entire park zoomed out view where you can still clearly see kirby. Kirby's Air Ride makes perfect sense as the name to me!